Here you have another great recipe for Father’s day! I hope you like it, it’s a delicious and super easy chicken in the Slow cooker! Season the chicken pieces with salt and black pepper on all sides. Place the seasoned chicken pieces in the slow cooker bowl also add in the onion, garlic cloves and two bay leaves. Mix the chicken broth with the spices. Ground thyme, dry rosemary, Italian seasoning and crushed red pepper. (you can replace the italian seasoning with a teaspoon of each: dry orégano, dry sage, dry marjoram, and dry basil). Into the chicken broth also add a bit of the red wine, just a bit, so all the flavor will start to combined. Pour this mixture over the chicken pieces in the slow cooker bowl. And also add in the rest of the red wine. Cover and cook the chicken in the slow cooker on low temperature for 7 hours or until the chicken is well cooked. Or you can cook on high temperature for 4 hours. Or you can Bake the chicken at 350ºF for about 90 minutes or until the chicken is well cooked. Or cook it on the stove on low heat for about 2 hours or until the chicken is cooked. After 7 hours in the slow cooker, now remove the chicken from the broth, and the chicken should be cooked by now, you can now serve with your favorite side dishes, just pour a bit of the broth over your chicken and serve it. I will be serving my chicken in buns, so after I remove it from the broth, now I will shred it, then place it back in the broth and continue to cook for another 30 minutes. After 30 minutes, remove from the broth, and now you can serve it. 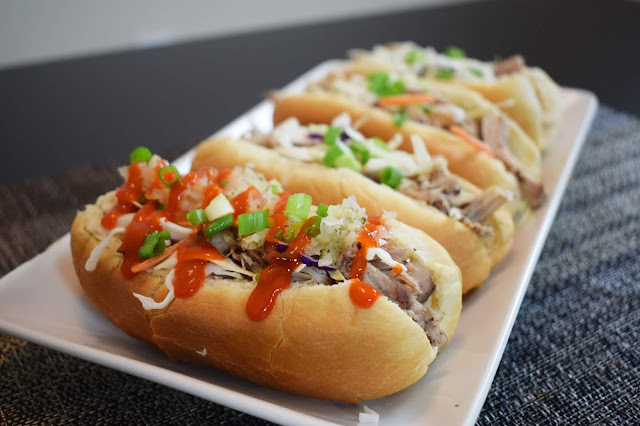 I toasted the hot dog buns a bit, now fill them with plenty of the shredded chicken and top with a bit of shredded cabbage and chopped green onions. Serve with your favorite hot sauce and enjoy!